IngredientsWHOLE GROUND CORN, SOYBEAN MEAL, CHICKEN BY-PRODUCT MEAL, CORN GLUTEN MEAL, BEEF TALLOW (PRESERVED WITH MIXED TOCOPHEROLS), ANIMAL DIGEST, TURKEY BY-PRODUCT MEAL, SALMON MEAL, OCEAN FISH MEAL, PHOSPHORIC ACID, CALCIUM CARBONATE, L-LYSINE MONOHYDROCHLORIDE, CHOLINE CHLORIDE, SALT, TITANIUM DIOXIDE (COLOR), VITAMINS (VITAMIN E SUPPLEMENT, NIACIN, VITAMIN A SUPPLEMENT, THIAMINE MONONITRATE, RIBOFLAVIN SUPPLEMENT, D-CALCIUM PANTOTHENATE, PYRIDOXINE HYDROCHLORIDE, VITAMIN B12 SUPPLEMENT, MENADIONE SODIUM BISULFITE COMPLEX (SOURCE OF VITAMIN K ACTIVITY), VITAMIN D3 SUPPLEMENT, FOLIC ACID, BIOTIN), MINERALS (FERROUS SULFATE, ZINC OXIDE, MANGANOUS OXIDE, COPPER SULFATE, CALCIUM IODATE, SODIUM SELENITE), TAURINE, DL-METHIONINE, YELLOW 6, YELLOW 5, LACTIC ACID, RED 40, POTASSIUM CHLORIDE, BLUE 2, ROSEMARY EXTRACT. 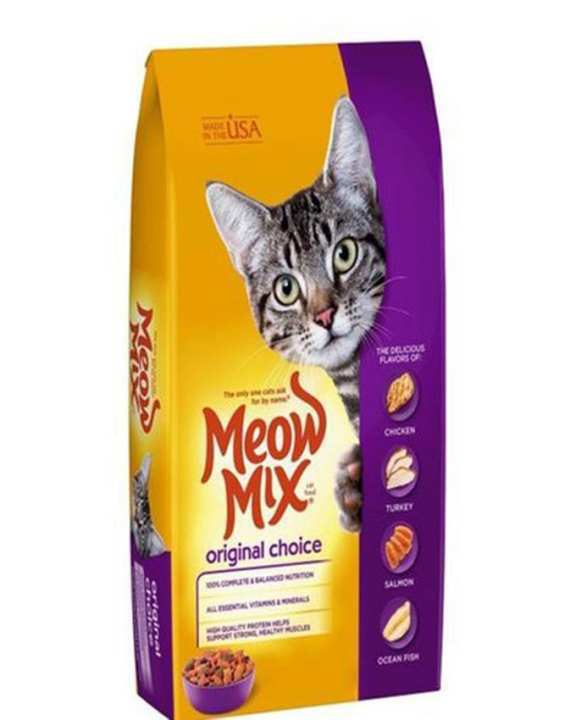 Nutritional StatementMeow Mix® Original Choice cat food is formulated to meet the nutritional levels established by the AAFCO Cat Food Nutrient Profiles for all life stages. Feeding instructionA single morning serving will allow your cat to nibble freely throughout the day. The serving size should be adjusted based on your cat's age and activity level. When introducing Meow Mix® Original Choice cat food gradually mix it with your cat's current food over the course of 7-10 days.Water is essential to your cat's good health. Always provide your cat with a bowl of fresh water.